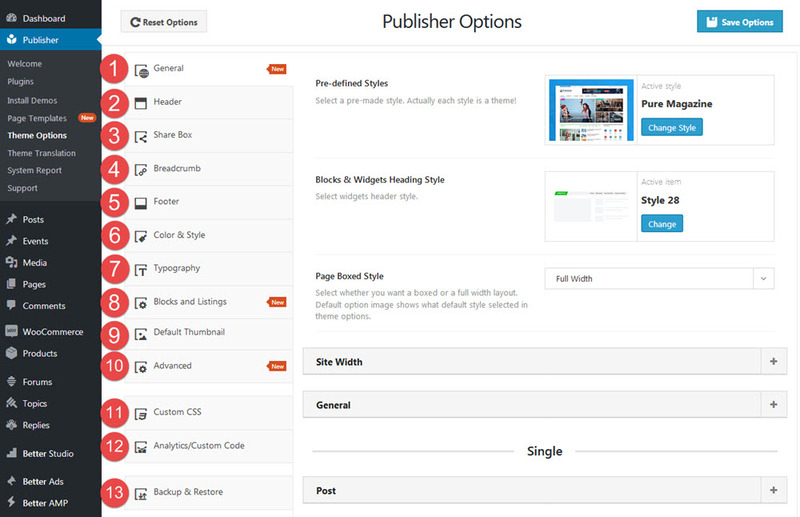 Publisher has an option panel with comprehensive settings and customization. You can manage most of the theme features from here. Also we add new features to Publisher option panel in every new update. Huge and easy customization of different parts of theme is one of the most important features of Publisher and Theme Options plays an important role in it. Features you can find in this panel are equal to tenth plugin! 1- General: Here you can find generic setting of theme different parts, mostly style and layout. Other settings are: Related Posts, Comments, Pagination, etc. 2- Header: Manage layout and style of header, logo, Top Bar menu and Off-canvas. 3- Share Box: Show share box in single posts and let your audiences share your post very easy. Manage your Share Box from here. 4- Breadcrumb: Show visitors the path they are visiting. Breadcrumb provides links back to each previous page the user navigated through, and shows the user’s current location in a website. 5- Footer: Manage Footer Instagram, Social Icons and Copyright from this tab. 6- Color & Style: Here you can manage displaying colors of all parts, for example: General Color, Topbar, Header, Footer, Posts & Pages, Widgets, Blocks, etc. 7- Typography: Manage your website fonts in detail. It’s possible to customize typography of Post, Header, Footer, Widget, Archive, Block & Listing. 8- Blocks and Listings: This is global setting for Publisher exclusive content blocks. Title Length, Excerpt Length, Post Meta, Post Format Icon, Category Badge and Read More button are examples of what you can control here. 9- Default Thumbnail: What if you forget to set thumbnail for a post? A default thumbnail or first image of the post will cover it. 10- Advanced: There are many advanced items here. SEO, Posts Ranking, Lazy loading and many other controls are contained here. 11- Custom CSS: Assign custom CSS to all website or just Responsive or Admin menu. 12- Analytics/Custom Code: Paste Google Analytics code or any other custom code. Place codes before </head> or </body> tag. 13- Backup & Restore: Export/Import backup of your settings.